There’s something about Pirate’s Grog Rum. WHAT IS PIRATE’S GROG RUM? 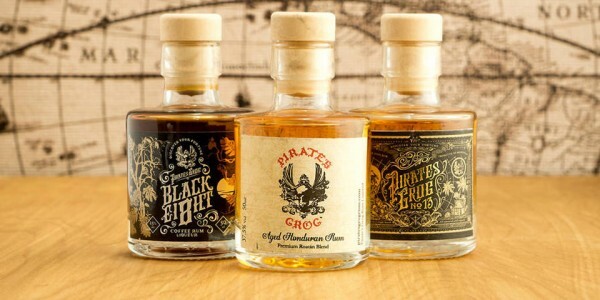 Pirate’s Grog Rum is a brilliant, blended rum from Roatán – a pirate stronghold in the 18th Century. Never heard of it? No, neither had we. And perhaps that’s the secret. Located between the islands of Útila and Guanaja, Roatán is the largest of the Honduras’ Bay Islands and Pirate’s Grog is the only rum to be exported from this part of the world. And it is on this elusive island that we begin our tale. Deep in the jungle, in the isolated village of ‘Hottest Sparrow’ (yes, it’s a real place and yes, it was around long before any ‘Captain Jacks’ of Pirates of the Caribbean fame…) two far-flung British travelers fell in love with a golden, sweet, fiery potion: Pirate’s Grog. So much so, that Gareth and Beth never returned to life as they knew it back in the UK, but instead made it their mission to seek out the alchemist responsible and recreate the blend, bottling the buccaneering spirit for the world to enjoy. The alchemist was the “honest, humble and happy” Robert J. van der Weg a.k.a The Dutch Pirate. Together, the trio crafted a premium blend, aged for five years in American oak bourbon barrels, and bottled in Hackney, London, that competes with the very best golden mixing rums. WHAT DOES PIRATE’S GROG RUM TASTE LIKE? The rum has a very vivid, inviting golden appearance, a touch darker than other gold mixing rums. The initial nose reveals subtle aromas of molasses, brown sugar, vanilla and toffee. On the palate, Pirate’s Grog is sensationally smooth with rich flavours of butterscotch, raisin and more vanilla. Well blended, well balanced, sweet and smooth – there’s no nonsense, no radical additions and no masking of flavours. This is a rum as rum should be. It works well served with ice, to sip, but really shows off as a mixing rum – with cola, or our personal preference, with ginger beer in a dark and stormy. WHAT ABOUT THE OTHER PIRATE’S GROG BLENDS? First up, say ahoy to (what we’re toting as) the eighth wonder of the world: Pirate’s Grog Black Ei8ht Coffee Rum Liqueur. Made by blending the original, golden Pirate's Grog with cold-brewed premium Brazilian Coffee Beans, Black Ei8ht combines the smooth sunshine of Roatán with the dark mystique of the rainforest. An elegantly balanced blend – the notes of chocolate, caramel and just a hint of toffee allow for the perfect post-dinner digestif. Alternatively, serve over ice as a nightcap or swap out the vodka and create a delicious Espresso Rumtini. Add the ingredients to a Boston shaker and fill with ice. Shake hard and double strain into a chilled coupette. Garnish with three coffee beans or a shave of dark chocolate. The third rum in the Pirate’s Grog Portfolio is the No.13 Single Batch. It's a rich, full bodied, and very smooth and satisfying style of rum which has an abundance of dried fruit, peach, apricot and spice flavours. Super limited edition, sample it in miniature form for something a little bit special. You know, like it being a Friday evening and toast to having survived another week. And finally, for a gift with a difference, look no further than the Pirate’s Grog Gift Chest: a bottle of Pirate’s Grog and a book all about pirates and rum and swashbuckling adventures presented in a printed treasure chest.